As the photos show, a plot inside Laguna de Apoyo Nature Reserve had been deforested, with the intention to sell the land in plots for a housing development. The Discover Real Estate sign was strategically placed along the road, although no permission had even been requested or given to subdivide land for plots in the area. Signs around the reserve selling Vistalagos, Los Congos, and others promise beautiful mini-mansions in paradise. This sign shows the way to a residential development for which land use approval had never been applied. Photo by Belen Camino. Developers without any permits for destroying land inside Laguna de Apoyo Nature Reserve had built a wall without permission, cut trees, cleared land, began forming roads, and even had signalled the area with a sign from Discover Real Estate. All this was learned by accident, when the cleared land gave way under a heavy rain and a landslide ensued. A long, high wall was built without approvals nor applications, blocking the property development from view of the adjacent community. This wall ruptured after retaining a large volume of water during a heavy rain. Photo by Belen Camino. The water which had been held back by the retaining wall rushed over deforested land inside the crater interior of the Apoyo volcano. No authorization had been given or requested to build this wall nor to cut the trees. Photo by Belen Camino. No one approved the cutting of trees in this photo, either. Note the contrast between the natural forest in the background and the razed land in the foreground. Photo by Belen Camino. No one approved of this landslide, either, but thanks to the other illegal activities on the part of the developers. Photo by Belen Camino. The environmental damage was enormous. 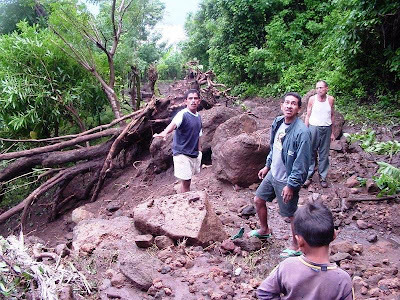 Trees were uprooted, soils on fragile slopes crashed into Lake Apoyo, and rocks littered the path. The path is subject to repeated landslides with every rain, now that large trees no longer hold the tephra soils in place and protect the ground from wind and rain. Destruction was absolute all along the path of this landslide, from the top of the crater all the way to the shore of Lake Apoyo. Photo by Belen Camino. Although some real estate companies in Nicaragua carry names and logos of US companies, they do not abide by any of the ethics guidelines to which the US real estate companies are obliged to adhere. "Let the Buyer Beware" is the universal policy in Nicaragua, even in the offices with US-sounding names, even when the agents speak English with American accents. There are honest real estate agents, but unlike in the US, the business community does not police them and force the bad agents and companies out. The photos from this event were taken after the razed property suffered an environmental disaster. A landslide developed after a heavy rain, taking soil and rocks from the top of the Apoyo volcanic crater, all the way to the lake, about four hundred meters lower in elevation. The access road to the lake was blocked, requiring thousands of dollars of expenses on the part of the municipality of Catarina. When the authorities arrived, they found the Discover Real Estate sign signalling the entrance to a property with an illegally constructed wall blocking the view from the community, dozens of illegally cut precious hardwood trees, cleared land without permission, and the beginnings of an access road which had never been authorized. The evident intention of the developer was to perform the land development in a plot inside the Laguna de Apoyo Nature Reserve before anyone would notice, and real estate agents did not scrutinize the legality of the process. The developer did receive a fine for this violation, and although the court costs were small, they set an important precedent: Nicaragua is not a banana republic to be bought off by carpet baggers! The government has held fast to their position regarding building inside the Laguna de Apoyo Nature Reserve. Subdividing, land clearing, real estate development of all kinds, and building are all closely regulated in the reserve. As this event demonstrated clearly, the Nicaraguan laws are considered a joke by many developers with an eye toward US retirees as potential buyers. There are ethical real estate companies and agents in Nicaragua, who don't hold a "circle-the-wagons" mentality regarding environmental concerns and full disclosure on property sales. If a real estate agent tries to sell you a plot of land in or near Laguna de Apoyo Nature Reserve, listen carefully, then check your information. 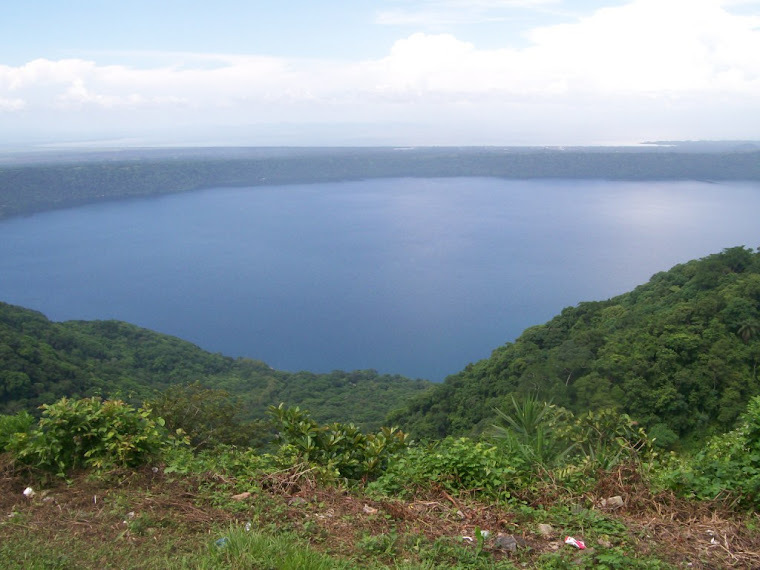 Simply put, properties in Laguna de Apoyo Nature Reserve can not be developed. Is the property inside the nature reserve boundaries? Did your agent tell you this up front? Does the property have all the permits for building? Don't count on your agent to answer this-find out in the Ministry of Natural Resources office and the corresponding local municipality. FUNDECI/GAIA has received dozens of complaints from buyers and prospective buyers regarding unfounded claims on the part of the sellers of property which the prospective buyers later learned were false.